TIRANA, Oct. 31 – Tirana has successfully tested the first electric bus and is on track to become one of Europe’s first capital cities to launch electric buses in a bid to reduce pollution. A Solaris Urbino 12 electric, a Polish production named ‘the bus of the year 2017,’ crossed the Kinostudio-Kombinat city line last week, becoming the first electric bus used in public transport in Tirana and the whole of Albania. A month ago, the municipality of Tirana licensed the first electric taxi company in a bid to reduce pollution in the capital city, which due to its almost 1 million residents and more than a hundred thousand vehicles a day, make Tirana Albania’s most polluted city. “What is happening in Tirana is what also happened in Paris where municipal authorities tested two buses on how they performed in Paris lines. 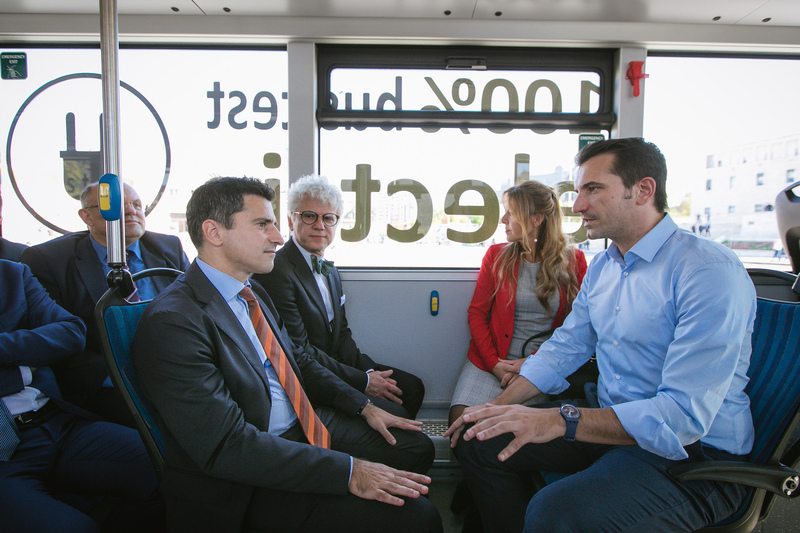 Instead of filling Tirana with tram cables or technology belonging to the 1970s, we have now decided to develop and move to modern avant-garde technology,” said Tirana Mayor Erion Veliaj. “Tirana is avant-garde. I am happy we are at the forefront of cities heading toward this development,” added the mayor. The country’s largest municipality says it will cooperate with the central government to provide incentives such as lower taxes and customs clearing as well as electricity refunds for use of electric vehicles. Several electric vehicles charging stations have already been made available in the capital city. The Tirana Mayor warned public transport operators to gradually start introducing electric buses if they don’t want the municipality to compete them with a state-run electric bus line, the same as it did with the establishment of a municipal-run cleaning company. “We will establish a public-run company if private operators don’t respond to this modernization rate. What we want is to gradually convert 10 to 20 percent of the bus fleet into electric ones,” Veliaj said. Electric buses currently cost twice the price of those that run on petrol but their operational cost is much lower, not to mention zero emissions making them environmentally friendly. Exceptionally quiet, emission-free, distinguished by its modern design and guaranteeing low operation costs, thanks to its innovative technical solutions Polish-made Solaris electric buses, already in use across Poland, Germany and France, can operate for an unlimited time, up to 24 hours a day. “We are at the initial stage and Tirana is joining the pilot cities introducing this technology. But as we have seen with other technology, from mobile phones to other equipment, the more they develop the lower the price becomes and I believe it will soon be more affordable for local stakeholders in our city to transform their fleets,” said Veliaj. Earlier this year, the Tirana Mayor was selected among the world’s top 40 innovative leaders under the Bloomberg-Harvard City Leadership Initiative. Socialist Party Mayor Veliaj has been in office for about three years now, leading the transformation of Tirana through dozens of public works and improved services, including the rehabilitation of the landmark Skanderbeg central square. The 37-year-old former civil society activist and social welfare minister is seen by many observers as Prime Minister Edi Rama’s heir apparent at the helm of the Socialist Party. The electric buses will also carry out performance tests in several other Tirana city lines to determine the kind of battery they need to use. Several leading global economies have already announced plans to phase out sales of new fuel-powered cars in favour of cleaner vehicles in the next ten years. Hailing the Tirana municipality initiative, Albania’s Energy Minister Damian Gjiknuri says the Albanian government will also mull incentives to promote environmentally friendly vehicles. “Even the Albanian government should think of how to incentivize more electric-powered cars as environmentally friendly vehicles which also address the pollution issue, but also meet targets we have set regarding electricity efficiency,” said Gjiknuri.